Not long after I left Boston on my previous trip in 2016, Render Coffee opened its second branch, continuing a recent theme of speciality coffee moving into the heart of downtown Boston. 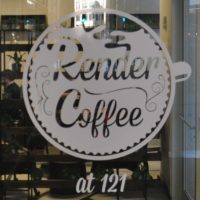 Just around the corner from downtown pioneers, Ogawa Coffee, you’ll find Render Coffee 121, appropriately enough, on 121 Devonshire Street. The first thing to say is that this is a totally different space from the original Render on Columbus Avenue. It’s inside the CIC office building, serving as an in-house café as well as being open to the public. The space, in comparison to Columbus Avenue, is huge, with high ceilings and a broad frontage onto Devonshire Street. However, both are long and thin, although 121 is probably four to five times as wide as the Columbus Avenue branch, but goes just as far back. Despite these differences, the coffee is just as good at 121. With offerings from Portland’s Tandem Coffee Roasters and the local Gracenote Coffee, you’ll often find the same coffee at both branches, but each manager has discretion to order what they like, so there may be differences. Unlike Columbus Avenue, there’s no breakfast/lunch menus, but you’ll find a similarly excellent selection of cake. Coffee shops in office buildings, particularly in shared office space, is increasingly becoming a thing. Grindsmith’s Deansgate branch in Manchester and the latest offering from Flat Caps in Campus North, Newcastle, spring to mind. I can now add Render Coffee 121 to the list, CIC acting as a shared/flexible office host and start-up/innovation hub. You can enter straight from the street using the Devonshire Street entrance or you can come in through the CIC lobby on 50 Milk Street, which takes you in through a door on the left-hand side of Render. Either way, you’re immediately struck by the size of the space. The counter is on the right-hand side and occupies most of the wall without really dominating the room. The main (Devonshire Street) door is on the left-hand side, with seating to the right between the two floor-to-ceiling windows and the counter. There’s a pair of high-backed comfortable chairs to the right of the door, carefully screened off by a series of pot-plants on a row of shelves. There are also two window bars and five, square, two-person tables, all well-spaced out in two rows. Opposite the front half of the counter is a twelve-seat communal table running length-ways down the store, the ideal spot from which to watch the entire coffee shop. No prizes for guessing where I sat then. Next is the door to the CIC lobby and then, at the back on the left-hand side, comes another cluster of tables. There are five, round, three-person tables arranged around a very fine-looking corner sofa unit with a low coffee table. Right at the back, in the right-hand corner, a corridor leads off to more office space. There is plenty of room for Render to try to squeeze more tables in, but because it doesn’t, the sense of space is just enhanced, giving it a very relaxed atmosphere. Even when it was busy, it was never that noisy. When it comes to coffee, there are two options on espresso, one on bulk brew and two on pour-over (Kalita Wave). There’s also (the same) decaf on both espresso and pour-over. If you don’t like what’s on offer, just wait a week or so and the coffees will change, depending on what the manager wants to get in. I’d popped into the original Render on Columbus Avenue that morning, where I’d had my breakfast and a cappuccino made with the West End Blue blend from Tandem Coffee Roasters. As a parting gift, the barista recommended I try the Burundi pour-over (also roasted by Tandem), so that’s what I ordered when I got to 121. My coffee was served in a standard diner mug and was rich and fruity, holding its own as it cooled, but never quite developing any further. I returned for an espresso, and having had two coffees from Tandem, I went for the single-origin Kenyan from Gracenote Coffee. This was a surprisingly long shot (20g in, 40g out, with a 32 second extraction time if I correctly read the recipe that was stuck to the grinder). The espresso itself was too bright and acidic for me, although by no means unpleasant. I wonder if my palate is changing though: I suspect three or four years ago, this would have had me fully funny faces! If you enjoyed this Coffee Spot, then take a look at the rest of Boston’s speciality coffee scene with the Coffee Spot Guide to Boston & Cambridge. This entry was posted in Boston, Cake, Coffee Shops, Evening Opening, Laptop Friendly, Offices and tagged include by Brian Williams. Bookmark the permalink. Great review, thanks for sharing, shame Boston is so far away from our home over here in Devon, in England! Sounds like Render Coffee has a real dedication to quality, and it’s great that they rotate new blends through regularly, you’re never stuck for choice. What would you say are some of the essential components of a great cafe? You’re welcome. Render has always stood out from the crowd. I’d say that the most important component of a great cafe is great staff. you can do what you like, but without great staff, you are sunk.